Many users love BioGPS because of its simple and intuitive way of visualizing expression data. 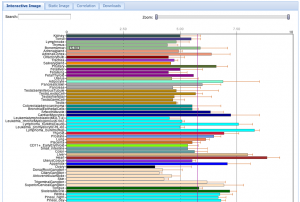 Previously, you were limited to a couple dozen data sets, mostly generated by our team. 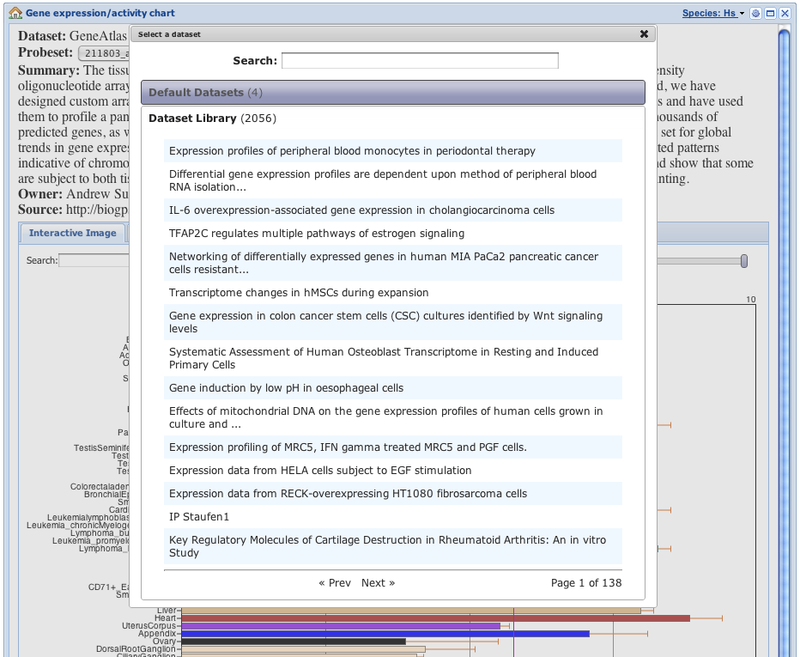 With version 2.0 of the data chart plugin, we added access to over 2,100 NCBI GEO datasets! More data than ever is available for use in the data chart plugin. With so many datasets now available for viewing in the data chart plugin, we knew we had to improve the way that datasets are searched and discovered. By clicking the new “change” link next to the current dataset’s title, a new dialog box will open that provides easy access to all data sets. 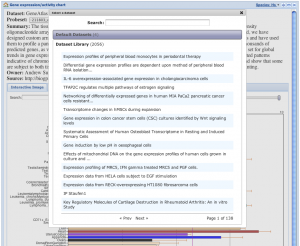 You can either enter a search term to search the entire BioGPS dataset library, or browse through pages of datasets and explore what is available. The dynamic data chart is no longer limited to the tall, narrow fixed size that its predecessor was. Now when you drag the border of the data chart plugin to a new size the data chart will follow. Go crazy. These changes come in addition to many backend and performance improvements, all with the common goal of making version 2.0 of the data chart the best to date. Try out version 2.0 of the data chart plugin and let us know what you think! Having trouble seeing the new data chart plugin? 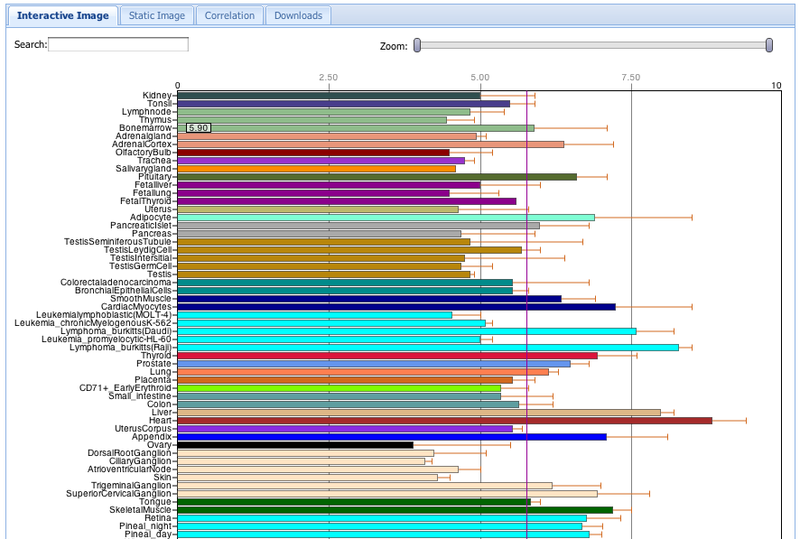 Please try reloading the gene expression chart as this is most likely a browser caching issue. If the chart still does not work for you please try reloading the data chart plugin directly at http://plugins.biogps.org/data_chart/data_chart.cgi?id=1017 while holding down the Shift key to clear your browser’s cache. If the gene expression chart still does not appear please let us know on the BioGPS Google Group. I can not see the data expression charts after you changed the plug-in. Tried to reload as you comment in the Google Blog. No expression charts as well. When activating the button, nothing happens. Kind regards for the help. Please let us know if you are having any other issues.